The Pentagon has released details to back up its allegation that Syria's government is planning another chemical attack. Spokesperson Captain Jeff Davis said the US had seen activity that "indicated active preparations for chemical weapons use" at the Shayrat airfield in western Syria. "This involved specific aircraft in a specific hangar, both of which we know to be associated with chemical weapons use," he said. Captain Davis said the activity had been recorded over the "past day or two" but did not offer further details on how the intelligence had been gathered. Syrian government forces are believed to have used the Shayrat base to launch a sarin attack on the town of Khan Sheikhoun in April. The attack killed 87 people and prompted the United States to launch airstrikes on the Shayrat base. Tuesday's statement attempted to add weight to a claim, issued by the White House on Monday, that the Syrian regime was making "potential preparations" for a chemical attack. 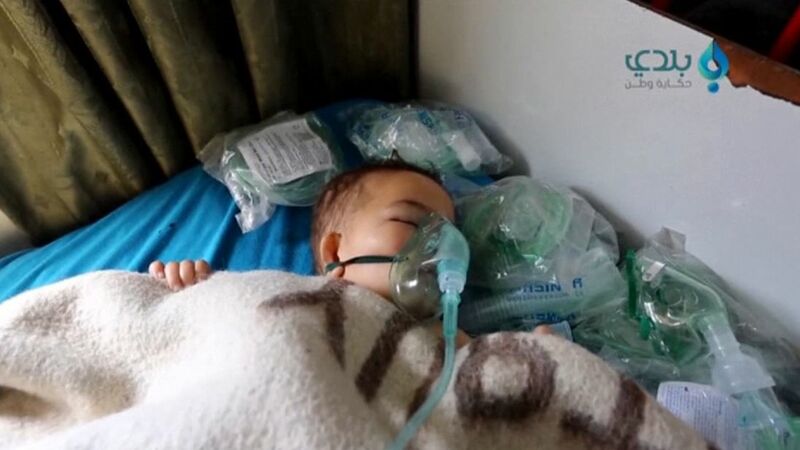 Issued by White House press secretary Sean Spicer, it warned of potential "mass murder of civilians" by the Assad regime, and said the Syrian government would "pay a heavy price" for a chemical attack. But the statement contained almost no evidence. Several State Department officials, who requested anonymity, expressed surprise at the warning. They said evidence for the claims was known by only a handful of individuals and added that it was considered unusual to make such weighty public announcements without extensive consultation.